This live webinar will be held April 3, 2019 from 11:00 AM to 2:00 PM via an online meeting space called ZOOM. The dial-in information will be provided via email when you register (video and audio options are available). Anyone may participate. If you are a licensed mental health professional you will enjoy the benefit of receiving Continuing Education Units. Space is limited to 50 participants. Dive deeper into Dr. 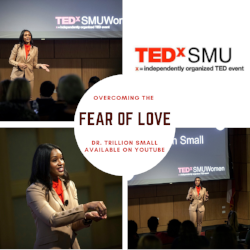 Trillion Small’s TEDx talk “Overcoming the Fear of Love”. This webinar will provide you with practical tools you can share with your clients as they attempt to mend the strained relationships in their life. It will also help as they heal from their “love triggers” that cause them to avoid relationships or be anxious in relationships. The information that you will gain from this webinar will help your clients better understand why they avoid or resist love and compassion from themselves and/or others. You will be eligible for 3 CEs. Trillion Small, with Attachment Leadership, LLC is approved by the Texas State Board of Examiners to sponsor continuing education for LMFTs (#1266), LCSWs (#7644), & LPCs (#3430). Our provider number follows each designated license. It is your responsibility to verify with your licensing board that they will accept these CEU’s if you are an out of state LMFT, LPC, and/or LCSW. To request a CE exam for this webinar, please email Attachment Leadership at info@trillionsmall.com. Upon completion of the exam, please email the exam to info@trillionsmall.com for review. Once you have passed the exam, your CE Certificate will be emailed to you as soon as it's available.